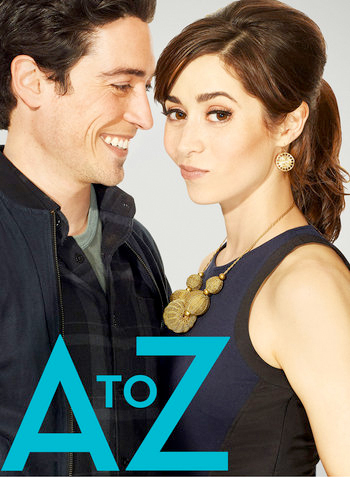 Of NBC’s comedy pilots, A to Z feels the most complete. This isn’t to say that none of their other comedy pilots were good—I liked Marry Me, for example—but rather that A to Z has a clear premise and announces its intentions in very plain terms. It is the story of a relationship between two characters, told from A to Z, that will span a set amount of time and reach a meaningful point of conclusion by the end of its first season. For some pilots, press tour is about critics looking for answers because the show is purposefully vague, or because—as discussed in a separate piece—there are changes going on behind-the-scenes. In the case of A to Z, though, the critics in the room have questions about details that are offered by the pilot, which is structured to the point where critics have enough information to have specific lines of inquiry that the pilot itself forces into the conversation. Mixology doesn’t make sense, at first. Television development is a game of risk/reward. Mixology represents a substantial risk for creators Jon Lucas and Scott Moore, as it’s their first television show and they’re playing with narrative in ways that most would advise against. As I noted in asking my question, there is no escaping this premise—whereas other shows can throw out their premises (see: Cougar Town) or make significant adjustments to characters as they evolve over time (see: Parks and Recreation, The Office), Mixology is tied to telling one story about ten characters in one night in its first season (which debuts tonight at 9:30/8:30c on ABC). It’s easy to scoff at this—I do it often when film writers move into television, seemingly with no attention to the medium’s specificity—but in talking with Lucas and Moore after the panel it became clear they understand television enough to know they’re breaking some rules. Although the room didn’t exactly buy Moore’s attempt to sell the show as “Lost in a bar,” it was at least a gesture toward the televisual tradition the show leans on, and on principles of episodic and seasonal storytelling the show needs to address to succeed. Mixology has aspirations, ones that make it an interesting experiment in how we connect with characters, and how stakes function in television comedy. It’s also a show that, six episodes in, makes more sense than it did at first, if not enough to make it a fully successful experiment. Tonight at 9:30/8:30c, FOX debuts the pilot for Enlisted, a new military comedy from Cougar Town co-creator Kevin Biegel, with Men of a Certain Age co-creator Mike Royce on board as his co-showrunner. I don’t want to talk about the pilot. This may seem strange: it’s the episode that’s supposed to demonstrate proof of concept, establish characters, and get viewers interested in seeing more stories in this universe. It’s also, all told, a solid pilot, one that highlights the bond between three brothers that is undoubtedly the heart of the show, so it’s not as though this is a case of needing to ignore the pilot to get to the good episodes after it. If you tune in to watch Enlisted tonight, you’ll find a well-crafted pilot that makes a clear, amiable case for tuning in next week. I saw all of the tweets about The Newsroom leading up to its debut. I saw them build with excitement around its beginnings, and then I saw them increase in volume while splintering off into numerous factions in the months leading up to its premiere. With some shows, screeners go out and very little is said about them within the critical community, with any chatter confined to backchannels. With The Newsroom, though, the conversation couldn’t help but spill out into public, and it became almost a rite of passage for critics to announce their opinion of the show so as to line up into certain camps. This isn’t abnormal, precisely: whenever critics write a review, they are stating their opinion and implicitly entering into a particular group of critics who felt a particular way about a particular series. However, everything about the critical discourse around The Newsroom has been explicit, at least following it on Twitter: this is partly because of the show itself (which is divisive), and partly because of creator Aaron Sorkin (who has a divisive history), and partly because of the show’s would-be relationship to the sociopolitical. Without suggesting that Aaron Sorkin has actually made a television show that will change the news media and those who bear witness to it (which he has not, just so we’re entirely clear), the fact that he wants to renders critical evaluations into sociopolitical evaluations for some, with the rejection or acceptance of Sorkin’s worldview becoming a reflection of the critic’s own. I don’t believe this to be true, of course, and have not read into—or read, actually—any of those critics’ reviews. When I realized that I would be going into The Newsroom tonight with the rest of the viewing public, I chose not to read the various intelligent, well-reasoned, divisive reviews of the series in advance; I knew I was going to watch it, and Twitter had already told me that the show is a case of “Your Mileage May Vary,” and part of me wanted to escape the discourse of Sorkin, and the media, and worldviews in favor of a more simple question. Is The Newsroom an effective television pilot? A recent Facebook thread featuringprofessors/grad students discussing potential pilots to screen for students in a Television class got me thinking about this. On one level, you want to show students something great, something that grabs their attention and potentially sends them off to watch the rest of the series: we had a number of students do this with Friday Night Lights this past semester, for example. However, you could also show them a failed pilot (like David E. Kelley’s Wonder Woman, which I know the folks at the Good TVeets Con recently watched) and ask them where they think it went wrong. While both strategies have merit, and are probably easier ways to communicate how pilots are intended to work, part of me wants to show them The Newsroom, which manages to succeed and fail in the same moments. Everything that works about The Newsroom is also everything that doesn’t, as Sorkin’s powerful use of momentum means we never have time to stop and connect to something more than a feeling that may not last as long as the show might like. I am aware that too much ink has probably been spent on the show already, and I’m likely repeating things many others have said, but I can’t deny that answering even this simply question left me plenty to say about The Newsroom. It is no longer uncommon for networks to post pilots online in advance of their premieres, with FOX most recently using this strategy to help launch New Girl to some very strong initial ratings (which have since that point slid considerably, but remain fairly solid). It gives the shows increased visibility within an online space, turning savvy consumers (those who will find it on iTunes, or Hulu, or OnDemand) into an additional marketing segment who will put the word out just enough that those 100 million people tuning into the Super Bowl, and tens of millions who will watch The Voice for two hours before Smash premieres on February 6th, will hear whispers of the show before it’s plastered throughout those NBC broadcasts (and, as Mike Stein pointed out on Twitter, a single person who has seen and enjoyed the Pilot at a larger gathering could spread the word quite easily). Like many others, I sat down with the Smash pilot via iTunes this afternoon – I had not seen the pilot when it was sent out to critics last Fall, so I was more or less seeing this in the fashion that NBC intended. The difference, though, is that I’ve read a lot about this show, and have seen enough trailers to understand its basic premise (and the basic beats of the pilot) more than the average viewer. As a result, while I would say that the Smash pilot is well-made, and there were parts of it I quite enjoyed (mostly surrounding the musical numbers at the heart of the story), I didn’t get that thrill of discovery that you ideally want to have with a television pilot. NBC isn’t particularly concerned about this, either: while they’re playing coy with the musical numbers themselves, they included an extensive preview of the remainder of the season at the end of the pilot download, providing viewers with a surprisingly comprehensive overview of what is going to happen in the show’s first season (although it is unclear just how many episodes we see scenes from). It’s a move that’s not entirely common in this day and age, but it’s a move that I find eternally frustrating as someone who tries to avoid spoilers at all costs, particularly with reality shows like Project Runway or Top Chef where the basic structure is already so apparent. The question becomes, though, why a show that does seem to have a strong serialized component (represented by the behind-the-scenes soap component of the series) would be so willing to reveal their cards before the show even begins. While I don’t know the actual answer to this question, I want to suggest (while offering some basic impressions of the drama, and some spoilery details for those who haven’t watched it or the preview that followed) that NBC is admitting up front that watching Smash isn’t going to be about surprise so much as spectacle, mirroring my own experience with the pilot and charting an intriguing if flawed course for the series moving forward. Considering that I haven’t written about a single fall pilot, it might seem unfortunate that I’m choosing Terra Nova. It isn’t the best network pilot I’ve seen, or my favorite: I those crowns would probably go to ABC’s Pan Am, a show that I thought understood its purpose and communicated it more effectively (if not necessarily more subtly) than any other series. I’d also suggest that Terra Nova is not the worst network pilot by a sizable margin, as regardless of its many flaws it is definitely going out of its way to make a major impact (which is more than we can say for a show like Charlie’s Angels). What draws me to Terra Nova, then, is simply that until tonight I had not seen it. Having screened so many of the pilots earlier in the summer, the sense of “instant reaction” was missing over the course of the past week, which was something that Terra Nova was able to deliver. There’s a thrill in seeing the snarky tweets piling up in Tweetdeck, or finally piecing together what critics who had seen the pilot (in multiple different iterations) have been talking about for weeks. Premiere week is all about first impressions, and the absence of real first impressions has led me to largely focus on a few tweet reviews and a lot of time following the ratings and waiting to see how second episodes fare. However, there are a few things about Terra Nova that need to be discussed. Most broadly, and what will I guess prove the basic thesis of the post to follow, is that Terra Nova is a classic example of a series being trapped between more and less. It’s like a television magic trick at this point, in which producers have to provide more exposition and explanation in order to keep viewers from being confused, but then they need to include enough mystery that they build anticipation and excitement. As a result, both the exposition and the exclusion end up feeling forced, resulting in a pilot that bears the fingerprints of producer/network manipulation. It’s also, honestly, not that bad if you just consider it as your run of the mill drama series; of course, that’s the last thing the show wants us to think.